The OFWIM awards program recognizes outstanding work in the field of fish and wildlife information services. In most cases, award recipients are announced at the organization’s Annual Conference. 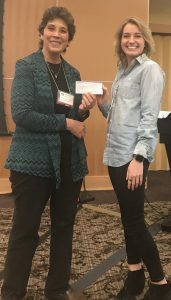 The OFWIM Student Scholarship recognizes academic and professional excellence among students enrolled full-time in fisheries and wildlife-related curricula at an accredited college or university, with research or studies emphasizing wildlife information management and/or geographic information systems (GIS). The scholarship award supports student attendance at the OFWIM meeting, at which they present their research. The VDGIF Law Enforcement Automatic Vehicle Locator is an application that supports agency communications between Law Enforcement Dispatch and officers in the field. Utilizing GIS, this tool provides law enforcement with near real-time information on vehicle locations, traffic and directions, navigation, terrain, and additional feature data sets. Established in 2013, this award combines two previous award categories: Best Web-based Technical Application and Best Collaborative Project. It recognizes excellence in the advancement of fish and wildlife information management technology or processes. Nominated projects or applications will be evaluated for technical accomplishment, innovation, success in meeting their stated goals, and/or success in developing and sustaining partnership. Nominees may be individuals or agencies/organizations, but the nominee must have retained creative control over any website or technical application. This award recognizes the best presentation offered at the annual meeting of the Organization of Fish and Wildlife Information Managers. Presentations are evaluated based on their oral delivery, effectiveness of accompanying graphics, thoroughness of coverage of the topic, analysis and insight into topic, and relevance to the conference theme. This award recognizes the best poster offered at the annual meeting of the Organization of Fish and Wildlife Information Managers. Posters are evaluated based on the effectiveness of their graphics, the thoroughness of their coverage of the topic, their analysis and insight into the topic, the presenter’s ability to discuss the topic, and their relevance to the conference theme.